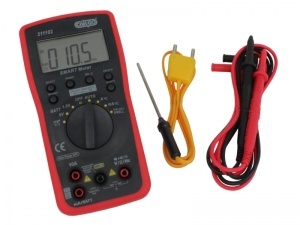 Auto-ranging digital multimeter with 4 digit LCD display, test leads and temperature probe. 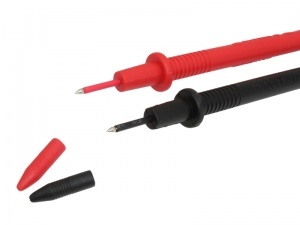 Auto detects between AC Voltage, DC Voltage and Resistance (Ohms). Features functions for measurement of voltage (DC & AC), current, resistance, capacitance, temperature and checks for 1.5V/9V batteries, diodes and continuity, . A multimeter is an invaluable tool to have when working with 12 and 24V electrical systems, enabling you to trace faults, confirm connections, detect current drain, check for high resistance and more. 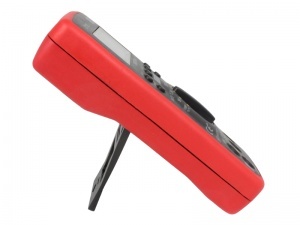 Features a built-in stand and has HOLD and Auto-OFF functions. Battery included.